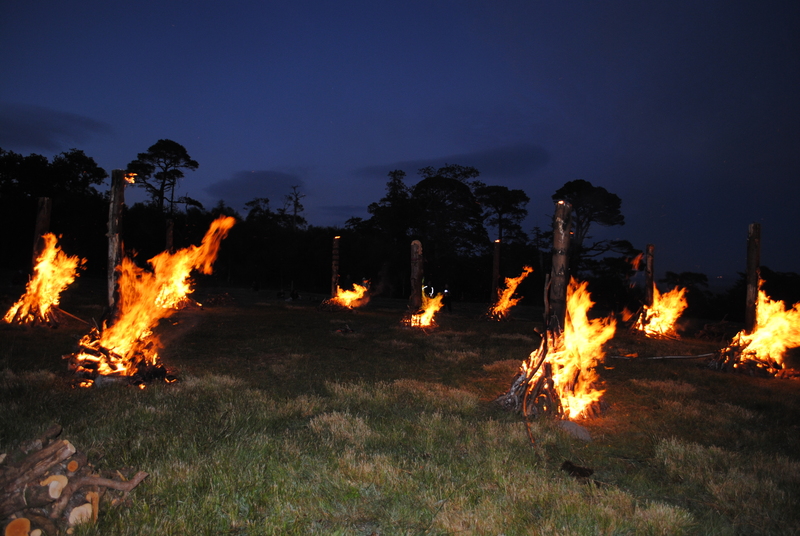 The power of the place became apparent long before the burning began. 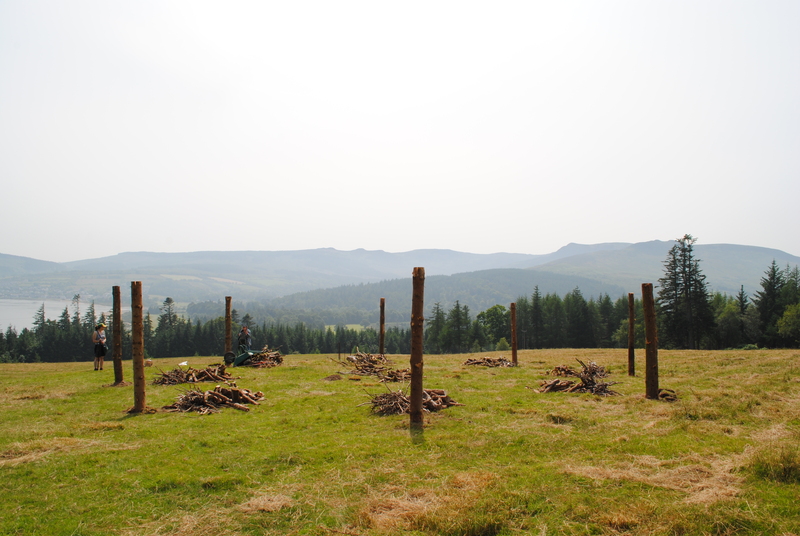 When the final timber was erected, we knew there was something potent at this location. 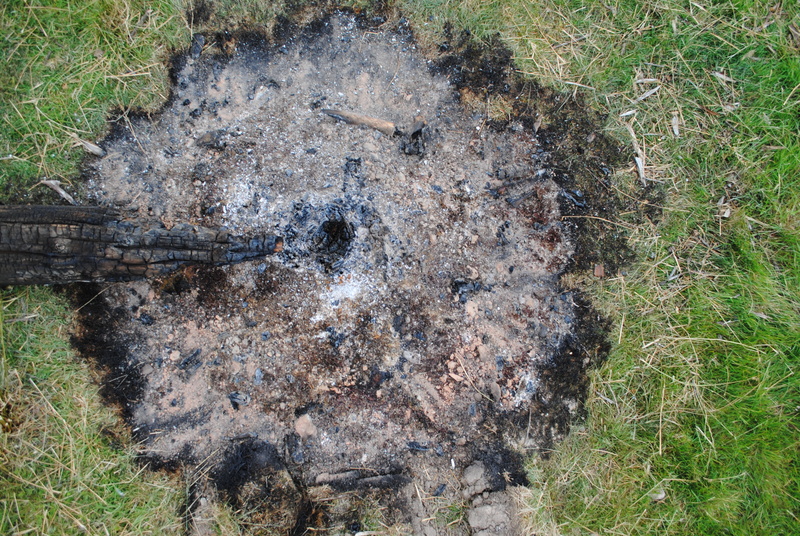 Perhaps it was the result of our physical labour, of breaking earth with antler pick, heaving timbers into place. Or maybe it was the growing mood of anticipation amongst those who built this place about what was going to come next: a nervous excitement, an uncertainty of what exactly would happen as night fell, and what the following morning would witness. Or perhaps it was the way the mountain top back-dropped the site. Or maybe it was knowing that you had created something tangible, solid, yet nothing more than a series of fleeting frames. And then there was the creation of a central focus, a figure head, a guardian. 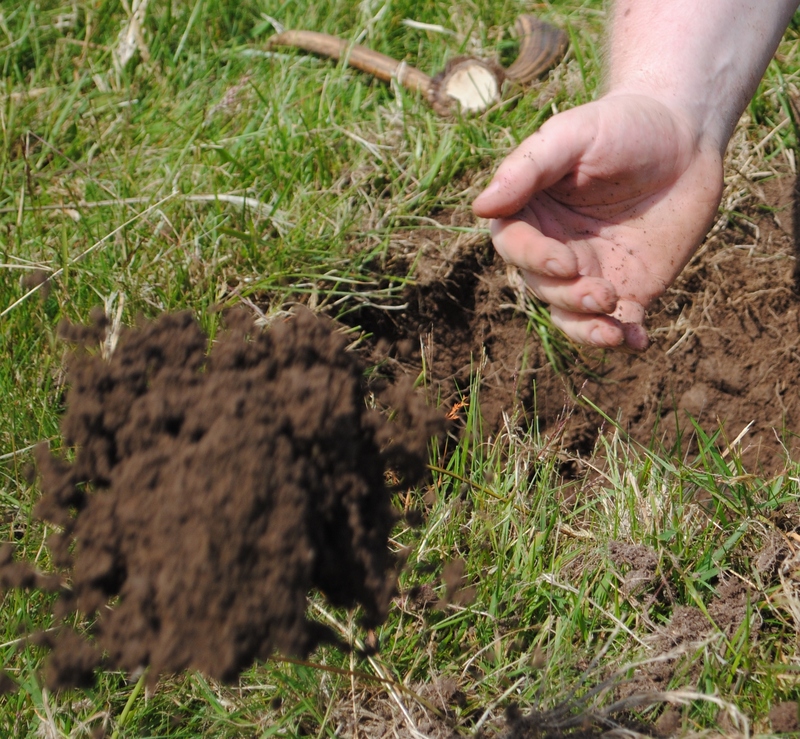 Around which deposits were placed, pottery made by the roundhouse located lower down the hillside. And, as the sunset, we were ready to commence. It was time, the right time, to burn the circle. 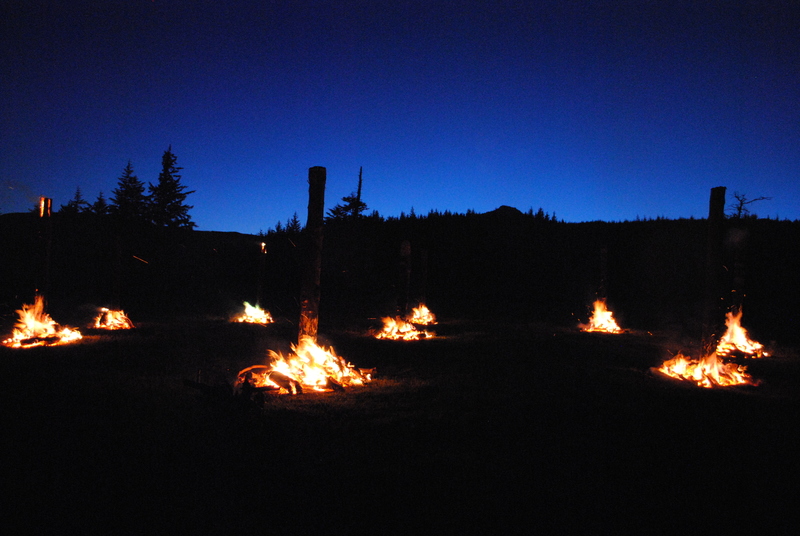 As the light faded, as day was stolen by night, we seized back the light, as the timbers began to blaze. It was transformed, another world, another place, of night and fire. For nearly four hours, we fed more fuel, creating an insatiable heat. The guardian in the centre of the circle looked on. Glowing sternly, in quiet contemplation of the events. In the centre, did it sit between one world and another, night and day, past and present, the sacred and the profane. What strange things did the guardian see ? Yet we were left the next morning with the proud timbers, survivors around the guardian. Only two companions had fallen in the night, others had burnt nearly through but stood on, what seemed to be precarious bases, slender charcoal sticks. Then we left the other world. 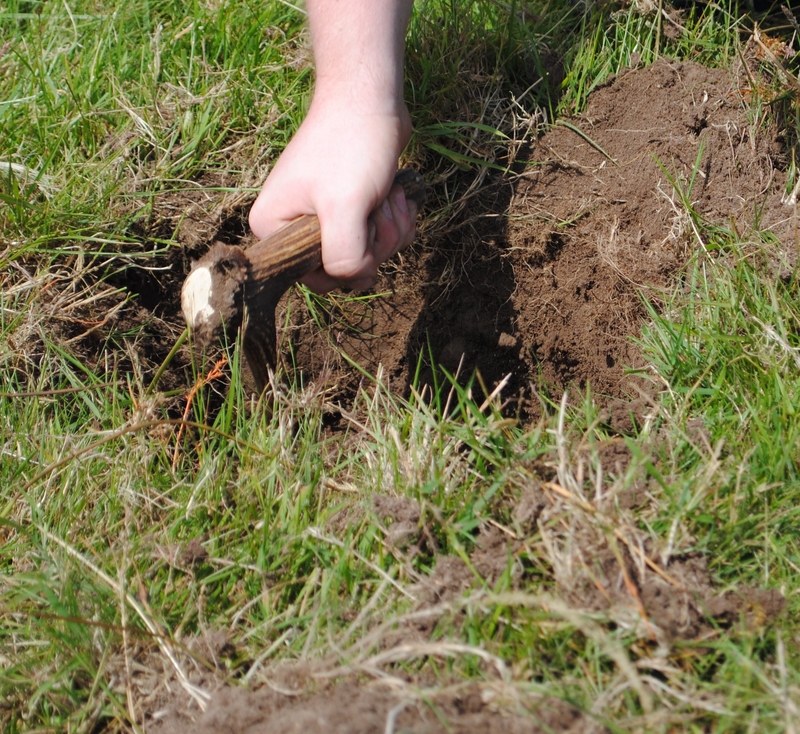 Trowel our instrument of divining the past. A past so recent, its smell permeated our hair and clothes, our eyes still blazed with a reflection of the night before. 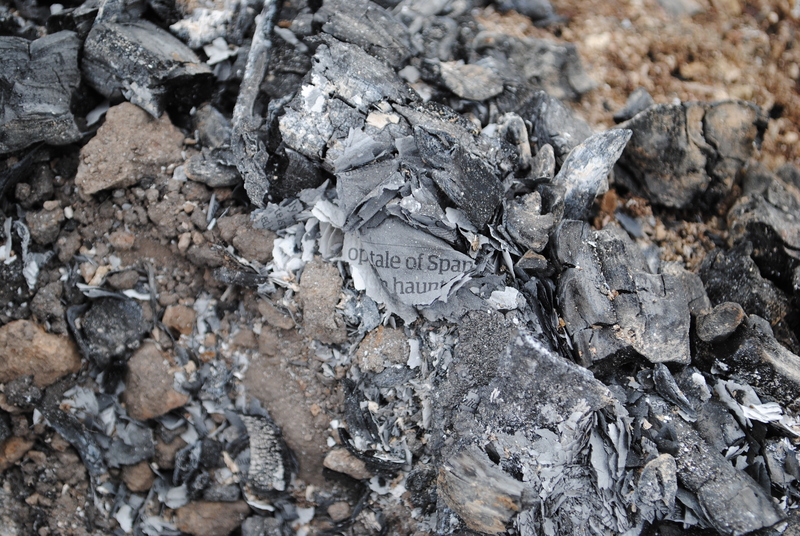 So, faithful trowel revealed that, despite masses of fuel (nearly five hours of burning in the night), once the wind had blown ash away and when ground was eroded away, beneath the topsoil there would be no significant trace of the burning to the archaeologist of the future. In time, only the post-holes, would reveal we were ever there at all. Yet as we departed, we knew we left something more behind, a tangible place overlooked by the mountain. most times it stands a lonely vigil. a place permeated by a vivid, visceral, vibrant, burning past. 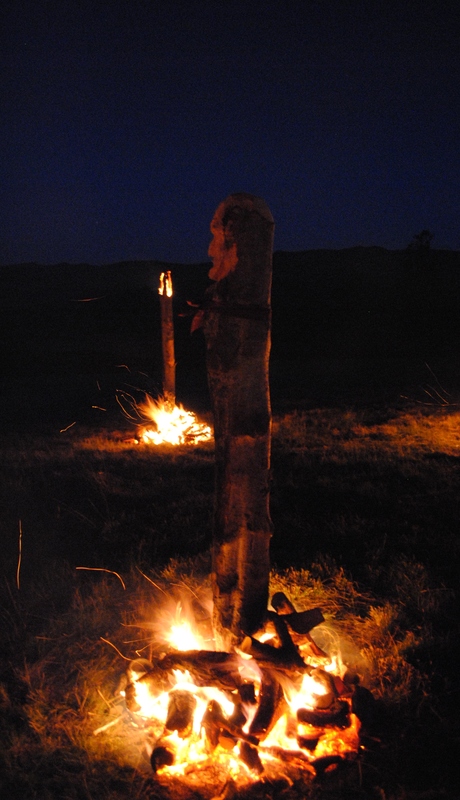 Burning the Circle was a festival of the Bronze Age delivered in July 2013 in partnership with Northlight Heritage, the National Trust for Scotland, the University of Glasgow and the Isle of Arran Brewery to raise awareness of and celebrate the prehistoric remains on the Isle of Arran. 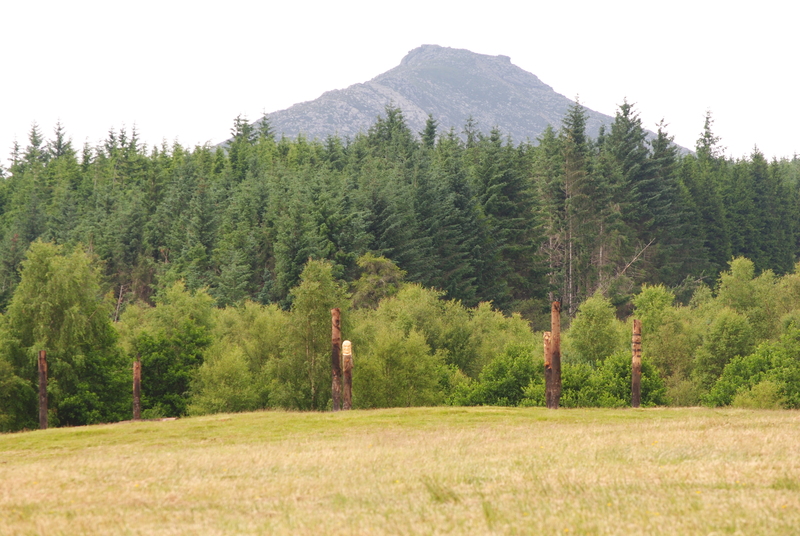 There is evidence for timber circles having been built on Isle of Arran, on Machrie Moor, over 4000 years ago. 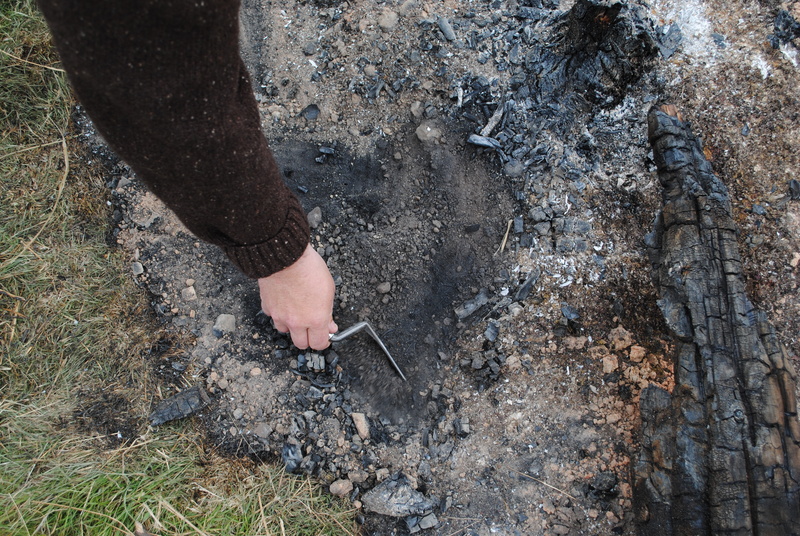 There are some excavated examples of prehistoric ceremonial monuments in Scotland and beyond where the soil has scorched deep into the ground when they were destroyed by fire. 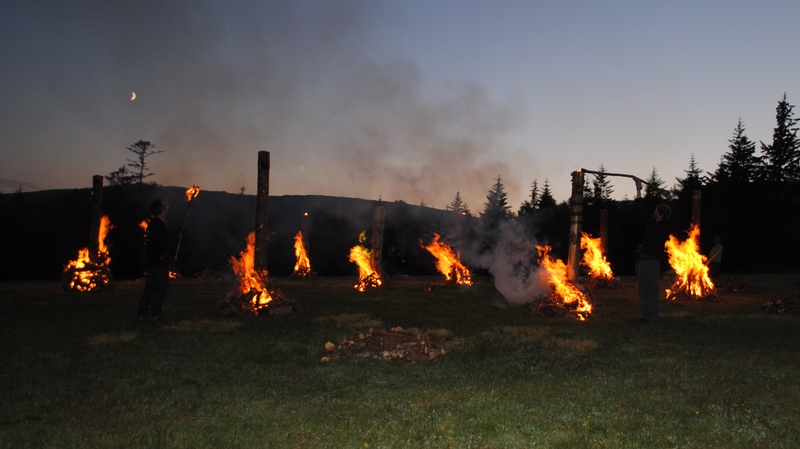 As part of the event, the timber circle was built for experimental firing to begin to explore what archaeological traces the burning of timber structures may leave behind and to better understand what circumstances are most visible to the archaeologist. 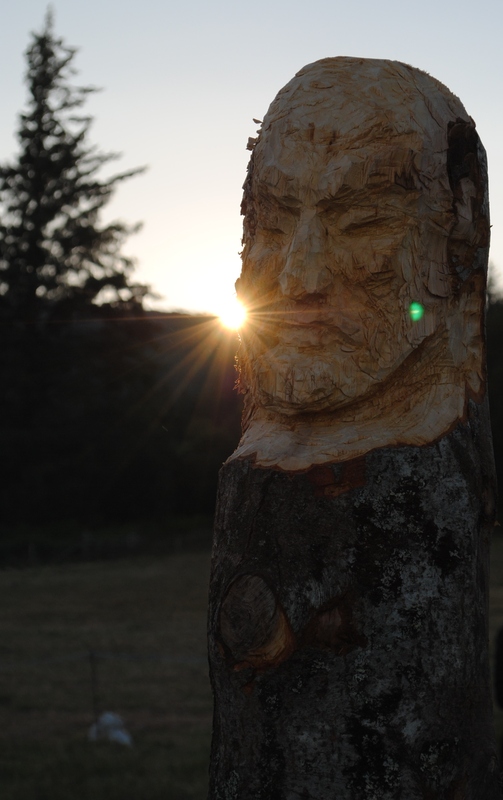 Many thanks to Marvin Elliott for undertaking the fantastic carving with bronze tools. 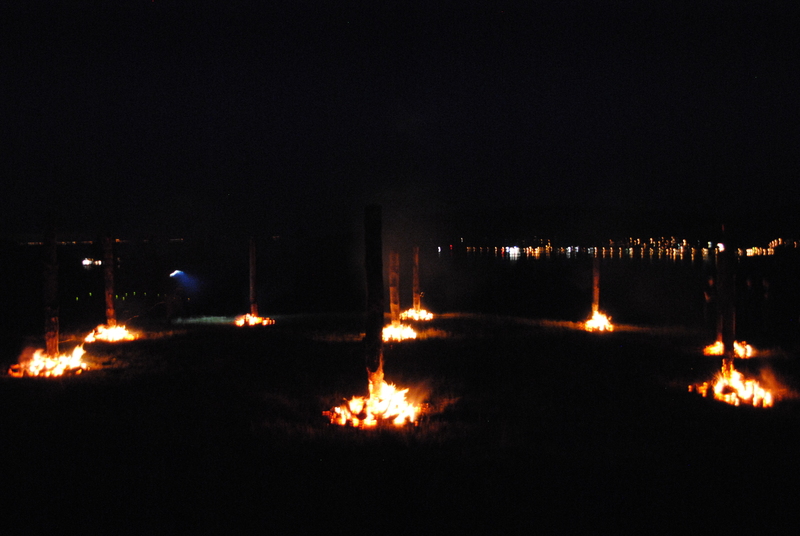 The event was greatly helped by the expertise, in other forms of pyro-technology, of Graham Taylor and Neil Burridge: amazing insights from both. For another perspective on the events, please visit the Urban Prehistorian. Big thanks to Corinna, Kenny, Richard, Joss, Steven, Katy, Katie, Kate, Ingrid and Derek they made it all possible. Looking forward to next years event….! 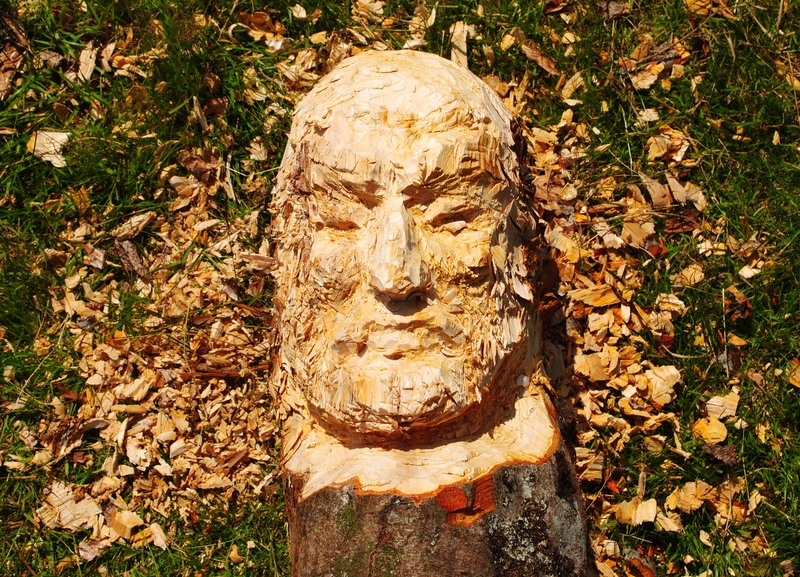 This entry was posted in Creativity, Heritage and tagged archaeology, Architecture, arran, burning the circle, carving, creativity, event, experimental archaeology, Heritage, isle of arran, prehistory, Sculpture by gmacg1. Bookmark the permalink.